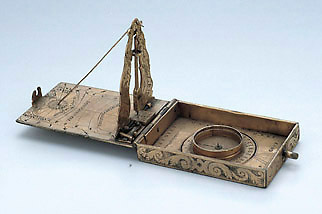 This inclining string gnomon sundial by Alexius Schniep is similar to others by the better-known member of the Munich based family, Ulrich Schniep. Unusually, when the sundial is set up for use, the signature is hidden by the base of the gnomon's support. As well as telling the time, the sundial indicates the declination of the sun. There is also a compass and a table of latitudes. The underside of the instrument carries an engraved image of a female figure in an archway. She presumably represents the goddess Urania since she is looking up at the stars and holds an armillary sphere in one hand and a pair of dividers in the other, with a quadrant at her feet.